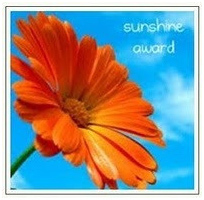 Thank you to Anna from I Heart Make-Up Art for nominating us for the Sunshine Award! And THANK YOU to all of our readers, especially those who comment and participate in this blog. You guys make it so much fun! Prefer giving or getting presents: I love giving surprises. My favorite pattern: Not sure! This one’s tough, but maybe zebra print? My favorite day of the week: Any day I don’t have to go to my full-time ‘paying’ job. Saturday? Kylie Frost – The Absolutely True Adventures of a Florida Snowbird – If you’re looking for wry humor, Kylie’s your gal. She spends part of the year living in Florida and part of the year in northern Minnesota. The dichotomy therein can make for some hilarious posts. Vintage Vonnie is a blog by romance author Vonnie Davis. Vonnie’s blog is filled with her humble, fun, and good-natured posts on life, disappointments, books, and all the things that fill her with joy. She often features guest romance authors. Profiles of Murder – by romantic suspense writer Diane Kratz. Profiles of Murder is a tremendously educational site about criminal profiling, serial killers, FBI terminology, and crime fiction writing. Even though there’s often scary stuff on this site, it’s deserving of the sunshine award because it often makes crime writers’ research easier. And it’s interesting even if you’re not a crime writer! Bookworm2Bookworm – A place for all book and romance lovers. I first got to know Mel…geez, I can’t even remember. But immediately I connected with her humor, sensitivity, and zest for life. Her blog has grown so popular she now has two partners that round out the blog with book reviews as well as adventures in dating and other real-life romance-related stories. OMG! You guys are great. Thank you for the recognition and congratulations also. I had written you a long comment and it got erased before it posted. What I wanted to say was that I’m so inept at blogging that I paniced when I read the instructions – putting in a logo and adding links – yikes! But I will get through it. We had a major storm on Wednesday and it took out my phone, internet and computer with a lightening strike. I’ll hopefully be back in business tomorrow and I’ll complete the questionaire and pass on the award. THANKS you two! Congrats on the award. Enjoy the sunshine. Always nice to learn more about you lovely ladies. Keep spreading the love.